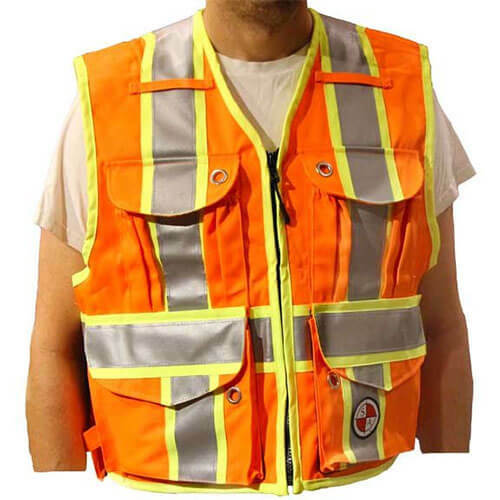 Safety Apparel's PC15X Party Chief Survey vest with full reflective "X" striping design on the back of the vest. 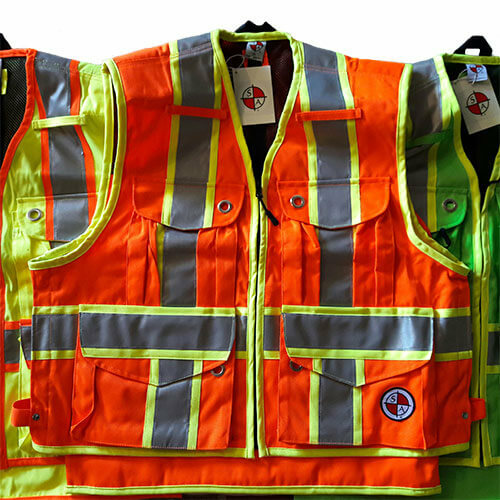 The ANSI 107/CSA Z-96 is compliant for use in the US, Canada and all across North America. Neon binding with silver 3M Scotchlite reflective striping, large YKK Vison front zipper closures with easy grip ergo handles, YKK coil zippers with easy grip ergo handles for back underlying trough pocket, deeper and wider front pockets, tighter straps, heavier stitching, lighter weight materials, and both inside trough pockets built tall for iPad or similar tablets. Features: Heavy Duty 900/600D material, hammer hangers, padded shoulders, YKK Vislon #8 zipper front closures with easy grip ergo handles, silver 3M Scotchlite reflective striping, vents, grommets for flagging, inside Velcro iPad pockets, large open back trough pocket with rivets and Power Stitched bartacks, wrap-around underlying back YKK coil zipper trough pocket with easy grip ergo handles, fleece-lined hand pockets, covered elastic pen holders, water pack hangers per state mandate, and it's cut short in the front to access tool belts, pants, and more.